Farmer investment in pasture development was a feature of the winter seed market. More grass to grass cultivation is occurring than in recent years, as farmers look to improve their pasture. Whereas, in the past five or so years, the emphasis has mainly been sowing to shift paddocks from cropping to grass, the seed varieties farmers are now purchasing underline the importance they are placing on regrassing land already in pasture. This requires ongoing commitment. A rise in farmers investing in regrassing is a sure sign of confidence in the sector. Rather than buying in feed, seed purchasing trends indicate farmers are increasingly looking to grow feed on farm, and seeking out ways to utilise every square centimetre of their land. Strong demand for run-off blocks has been a feature in many regions over the past few months. Those buying such properties are following through with their seed purchases, taking the opportunity to improve soil fertility and maximise the feed they can take off. Environmental conditions are a factor in seed purchasing decisions. Farmers are planning ahead for when they will need feed, identifying gaps in their projected feed supply, and deciding when and what they plant based on achieving as much flexibility as possible from the feed they will have available for their stock. For example, building flexibility into farm management helps enable individuals to avoid finishing lambs at the same time as everyone else, a tactic that will gain an obvious advantage from meat company schedules. One positive trend in the seed market in recent months is the uptake of new brassica hybrid product, Raphno, which is a radish and kale cross that is finding favour with those lamb finishers who realise that total meat production per hectare is a key driver of their farming system. Farmers are always looking to gain an advantage and, for those with confidence, this variety offers clear benefits. Also of benefit, to those who know how to find it, is the value of investing in proprietary brands rather than common seed. Proprietary seed is more expensive for a reason: it has had considerable innovation, research and development invested in it before being offered to the market. In return for this price premium, proprietary seed offers the opportunity to farm more sustainably and maximise farm assets. 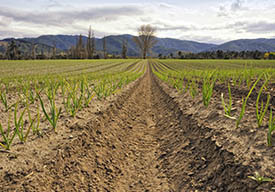 During the season ahead, farmers will be well advised to take care around crop rotation. For those crops susceptible to disease, over-cropping can lead to problems. Careful rotation can help maximise yield and ensure problems with over-cropping are avoided. This report was prepared in consultation with PGG Wrightson Seeds.